Imagine yourself encapsulated within a turquoise blue bubble, watching shoals of reef fish swimming lazily by - sometimes in three or four layers of different species above the reef floor. This is the heart-stopping experience that awaits you in the underwater room. The floating structure, Swedish engineered, provides three levels, those above the water clad in local hardwood, and each an experience in itself. Your journey will start by boarding a traditionally crafted wooden boat to take you out to the underwater room. 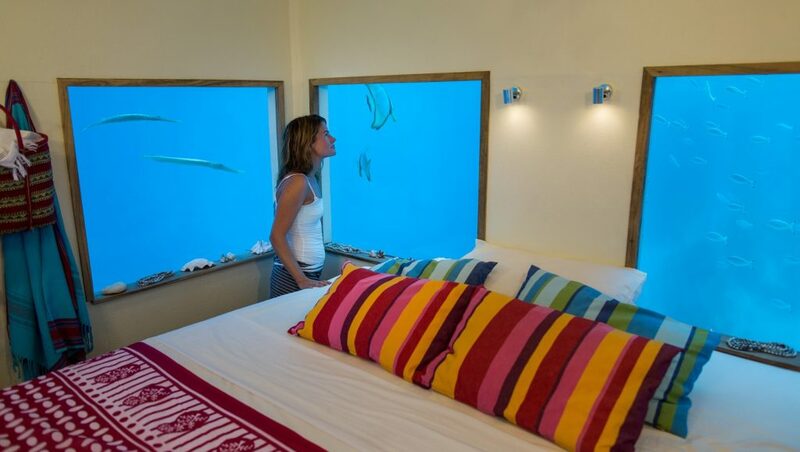 The room lies approximately 250m from the shore, about a 2min boat ride over the crystal clear waters of the Manta house reef. On arrival at the room, along with your service fundi and boat captain, you will get shown the ins and outs of your private floating island. We will then leave you alone to enjoy your new surroundings. Once settled in, a light tropical lunch with cold drinks will be ready for you to enjoy at your leisure. 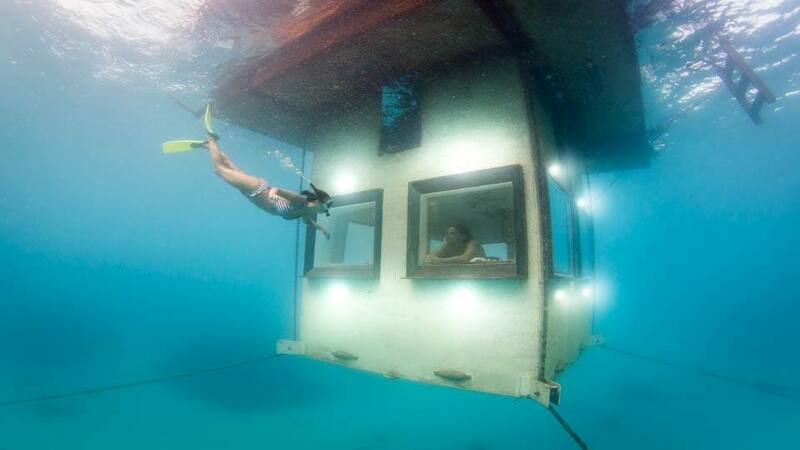 A kayak, snorkel and fins will be provided. The underwater room lies in what we call the blue hole, which has some fantastic coral heads and an abundance of marine life. After having sundowners on your preferred deck, dinner will be served at a pre-arranged time decided by you and your fundi. After dinner you will be left to yourselves. Breakfast will be served at a pre-arranged time. When arranging your meal times your dietary requirements and meal options can be discussed too. Sleep under the stars to the soft murmuring of the sea. 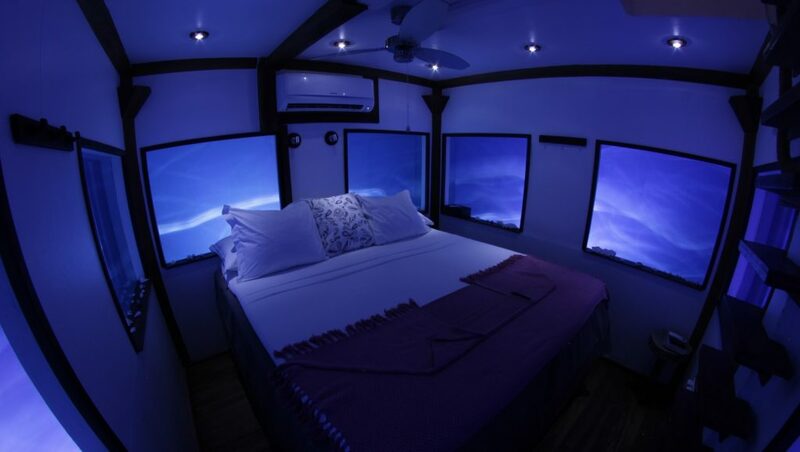 Three hundred sixty degrees Then downstairs – the magical feeling of lying on a soft double bed surrounded by panes of glass affording almost 360 degrees viewing – watching the shoals of reef fish and exquisite, often rarely seen individuals visiting your windows. Some have taken up residence around the room, which affords them some protection from predation. For instance, three bat fish and a trumpet fish called Nick who is always swimming around and seemingly looking in! Underwater spotlights By night, the underwater spotlights beneath each window around the room attract the shyer and more unusual, for instance squid. Coral is already establishing itself on the anchoring lines and around the underwater structure. Octopus and even spanish dancers have been seen attaching themselves to the glass panes. The reef inhabitants can simply not resist attraction, which makes for exciting watching and a truly unique experience!